#LASD – Great job TPD deputies on this arrest!! Be alert – Report any suspicious behavior, persons in unauthorized areas or unattended packages to Metro or Sheriff’s personnel immediately. We encourage all riders to put the Metro security hotline in their phones: 888.950.SAFE (7233). The problem was caused by damage to a fiber optics cable on the Blue Line, as we posted earlier. Service was restored for this morning. Again, thanks to everyone for their patience who was impacted on this. Some fresh pics of the work on the Crenshaw/LAX Line junction with the Green Line just south of LAX. Trains will travel in a trench next to the south runway and then climb on a ramp to the junction. Praise for Metro’s plans to purchase 35 electric buses and make the fleet comprised entirely of zero emission vehicles by 2030. The Metro Board also approved the purchase of 294 40-foot near zero emission compressed natural gas buses on Thursday. Please see this post for more on the agency’s strategy to convert from CNG to a zero emission bus fleet. That Winchells looks pretty good next door! Credit: Image via Stanley Saitowitz | Natoma Architects. 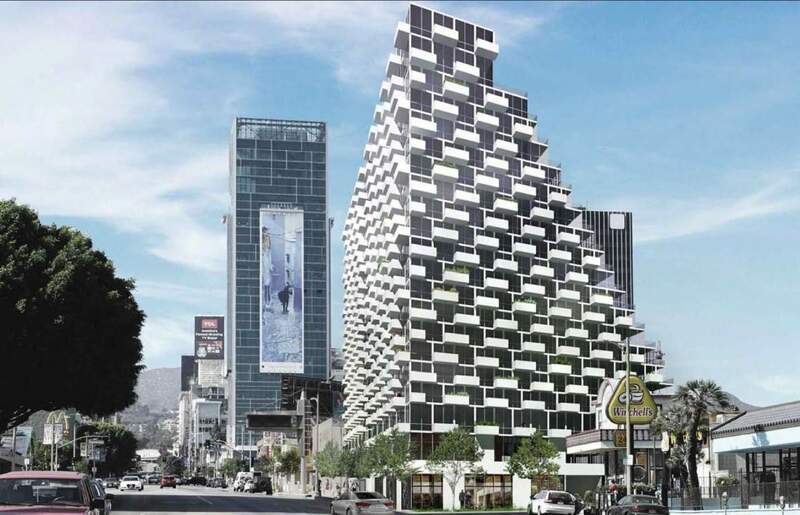 The 21-story tower would be near the Red Line’s Hollywood/Vine station and have 429 apartments, including 16 very low income affordable units, so says Urbanize. Seems like the right kind of place to build a big building. A new study tries to predict how many more 95 degree days the world may see. Our region isn’t as impacted as many others. If you live in the Midwest — might be a good time to start digging that swimming pool. As for air travel, the extra hot weather seems to be mostly a problem involving smaller planes in desert areas — i.e. Phoenix — or places with short runways where hot air may not provide quite enough lift. A tad alarmist, but interesting. Things to read whilst transiting: fun New Yorker profile of Father John Misty. Electric buses have so far been a failure for the MTA. the 4000 series from NABI can be seen sitting in the old Division 12 Yard awaiting sale. There were a new batch returned to the manufacture due to their inability to complete their assignments that required charging stations. What makes the MTA believe that new technology will be available in a couple of years? The MTA is not a small town operation where buses run for eight hours or less per day with long layovers that can allow for re-charging. Instead all new buses must be able to operate for 16 to 20 hours per day utilizing several Operators. As a bus operator for the RTD in the 1980’s I worked an assignment on Line 4 that pulled out at approx. 4AM on the week-ends and I pulled it in at 2AM the next day. While this is not the norm today relegating new electric buses to tripper only assignments does not seem to be a reasonable alternative or a efficient use of equipment. Had Metro ever considered a trolleybus network with overhead wires, like they use in downtown San Francisco? I’ve read that the first LA Metro had such a system back in the 50s. Not in recent times. The agency has focused mostly on either subway or light rail. Interestingly, SoCal Edison floated a proposal to convert some bus lines to trolley buses back in the late 1980’s. This was back when electricity rates were reasonable. Now Edison and the eco-wackos are attempting to increase rates for residential customers during our unavoidable use time – 5pm to 9pm.